A 19-year-old has been imprisoned for beating a priest with a metal baseball bat in a homophobic attack. Martin Powell hit the Most Rev Dr Barry Rathbone twice with a metal bat as he sat in Bournemouth Gardens, Dorset. 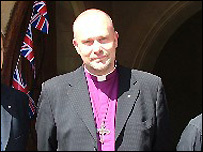 Dr Rathbone lives in Bournemouth and is the openly gay parish priest for the multi-faith Beacon Project. 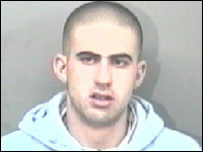 Powell, from Bournemouth, was sentenced to two years in a young offenders institution with a further two years on extended licence for the assault. Powell had earlier admitted assault causing actual bodily harm. The Western Circuit Recorder, Geoffrey Mercer QC, said: "This was an extremely unpleasant assault. It was premeditated in that you deliberately armed yourself with a baseball bat. "It was unprovoked and it was an act with a baseball bat upon an innocent victim at night. "It's a matter of chance that the victim was not more seriously injured. It was an offence which was aggravated by homophobic motivation on your part." Bournemouth Crown Court had previously been told that Dr Rathbone had been eating a burger on his way home after a night out when he was approached by Powell who asked: "Excuse me mate, does anything go on round here?" Dr Rathbone said he believed the area was a "gay cruising site". Powell, who was under the influence of alcohol and amphetamine, called Dr Rathbone "a queer" and then pulled out a three-foot long baseball bat and swung it at the clergyman. Powell, who was with his girlfriend, then demanded money but left with just a half-eaten burger. Dr Rathbone suffered a bruised hand as he had tried to defend himself and tenderness to his ribcage. He is now nervous of walking outside alone, the court heard. In a statement Dr Rathbone said: "Martin Powell took a decision to go out that night, armed with a baseball bat, seeking to cause harm and damage to innocent people. "While I would rather have avoided the incident, for obvious reasons, I am glad that I suffered at his hands rather than someone possibly less robust. "I forgive him unequivocally as my faith and, I believe, my personality are strong enough to do so."